Jenna loves to help....help fold laundry, help set and clear the table, help get food prepared...she just likes to be in the middle of the action. 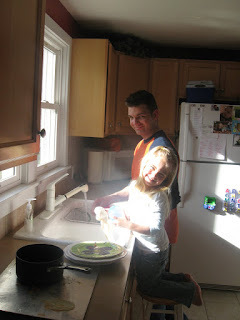 Last night after dinner Jenna wanted to help Dave with the dishes. She started out at the rinse girl but then promoted herself to washing them. I'm sure it actually took way longer than if Dave would have done them by himself but he wasn't going to argue with her enthusiasm to help! With the two of them occupied I got laundry folded and the rest of the night we could spend playing. Before eating dinner last night I asked her if she wanted Dave or I to pray or if she would prefer to say the Lord's Prayer together as we have been doing occasionally. To our surprise she wanted to say the Lord's prayer by herself and she did from start to finish. It's so cute to hear some of those big words coming from such a little person and even better to know that the things we sometimes think are not really having any affect on her really do sink in.